With a mysterious voice coming through the CB radio, Trace begins to comprehend the deadly nature of his stolen payload. 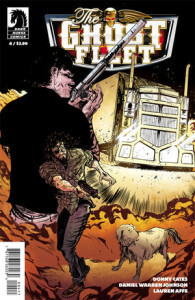 His old friend Ward, director of the Ghost Fleet, will do anything to retrieve that truck . . . even hiring loose-cannon bounty hunter Mickey Reno! Without a doubt, strange things are afoot. We’ve got ghostly voices over the CB, seemingly invincible “shadow assassins, and a mysterious past for pretty much every character in the book. In issue four, we’re starting to see some entanglements between Trace and Ward that goes deeper than just friendship. Also, the contents of the stolen truck have yet to be revealed, but I’m going to go out on a limb here and say that it isn’t a shipment destined for Pier One. There are a couple things I really like with this title. First, the dialogue is quick and witty without going to far out into the realm of inane banter. Every character seems to have his or her own distinct “voice” to go along with a rooted place in the story. Also, there really is no cut and dried “good guy/bad guy” to be found. The creators don’t seem to be shy about throwing a little dirt on pretty much anyone. We get a little deeper into the complete train wreck that is Ward, mostly seeming to revolve around the death of his wife. There’s also some question thrown into the relationship between said wife and Thrace… maybe not a full blown affair, but a question or two have been raised. I already know I’m gonna have to sit down and read through the series again… There’s a lot going on here, and I want to revisit it because I can’t shake the feeling that I’m missing something important.